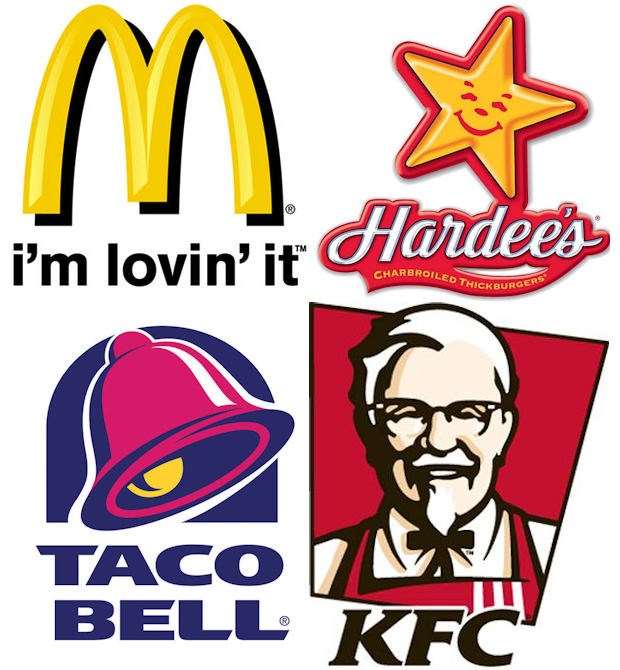 Reluctant Chauffeur: Vegetarianism: Should vegetarians eat fast-food? Vegetarianism: Should vegetarians eat fast-food? In a recent post, I pointed out that many vegetarians focus on keeping meat away from their mouths more than they focus on things that matter like preventing animal abuse, staying healthy, and buying food responsibly. My point was wonderfully illustrated by comments on the article. Unless you're a vegetarian for the image and feeling, your behavior should reflect more than just your attitude toward meat (or lack thereof). Reducing animal exploitation, increasing availability of healthy foods, and other typical vegetarian causes require that we act intelligently when talking to others and spending money. 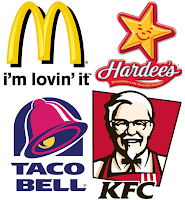 Some well-meaning vegans have chosen to ignore the fast-food and chain restaurant market because of its emphasis on animal flesh, but the bottom line is this: In order to convince meat-eaters to stop eating animals, vegetarian options must be convenient and available in the places where meat-eaters munch. There will never be vegan or vegetarian options at restaurant chains unless vegetarians and vegans support them. The article goes on to recommend over a dozen vegan options offered by major chains. Besides the obvious truth, that there are many ways to convince meat-eaters to stop eating animals besides having vegetarian options where they eat, I have to agree with PETA's stance. Vegan options in fast-food restaurants are a good thing and we want to keep them there. However, other detrimental side effects resulting from fast-food makes me recommend it sparingly, particularly for vegetarians/vegans. 1. Having vegan options doesn't change fast-food's value: A "vegan-friendly" rating by directories like HappyCow means the restaurant offers vegan options, not that the company is particularly friendly to vegans or the community in general. Corporations and the chains they own are “friendly” to people with money. Once any company determines money can be made from offering vegan items at its restaurants, it will. Supporting these restaurants still supports harmful, cheap, food. It enables the company to grow larger through public advertising and new restaurants. Why would anyone want to support this type of eating in their community on a regular basis, vegetarian, or not? 2. The receipt doesn't say you're vegan: Buying a veggie burger or subway test sub is a vote for the vegetarian, but many vegan or vegetarian options are side items. They're eaten by all types of people, often alongside a burger. When items like side salads, baked potatoes, and coffee are purchased, the money anonymously supports corporate advertising and growth. If you want to support vegan options and ideals, buying a side item or coffee isn't the way to do it. 3. Eating at a fast-food restaurant means you're not eating somewhere else: This seems obvious, but many people don't consider it. If you're a vegetarian, supporting restaurants with similar values is important. As mentioned above, most corporations base whether to offer vegan options on sales statistics. This is different from many independent restaurants that are run by people who genuinely care about animals and healthy eating. I'm sure these entrepreneurs want to make money, but there is usually more going on. I've seen firsthand how these restaurants offer classes, provide information, and support local farming. It's something you might see in other independently owned restaurants that serve meat, but not fast-food. As Breaking Bad taught us, fast-food restaurant owners are just passionate about selling meth. 4. If you don't, someone else will: Eating at fast-food restaurants is often more convenient than eating elsewhere. Sometimes when traveling through a food desert or with friends, it's the only reasonable option. Chances are you'll eventually have an opportunity to try that vegan option. Why not eat elsewhere whenever you can and let the fast-food restaurants get support from vegetarians who aren't as strict with their diet or when you're short on options? I don't think the success of a new vegan entree requires that every vegetarian in the city swing by to try it. That money is better spent elsewhere. 5. Vegan ≠ healthy: Just because a fast-food restaurant offers a vegan option doesn't mean that it's healthy. It just means animals weren't harmed. Being a vegetarian to help animals is honorable, but being healthy for your future self is doubly so. Contrary to popular opinion, supporting an unhealthy diet is something both vegetarians and meat-eaters are guilty of. Many meat substitutes aren't healthy at all. I wrote about them in last week's post. 6. Power of opinion: Sometimes the best way to make a difference is by writing a letter or posting a review online. Companies take this input seriously, particularly when in bulk. Writing a request for veggie burgers at a local chain is probably more effective than eating a side-salad there regularly and hoping the restaurant gets the idea. Writing this post has made me hungry-- off to eat something; something that's not fast-food!